After a few years spent making only documentaries, filmmaker Werner Herzog recently made a return to narrative film with two features. While technically 2016 releases, both films have had their Cleveland premieres this year. The first, the epic biopic QUEEN OF THE DESSERT, was a sumptuous yet inert period piece that dealt with some of Herzog's usual themes (a driven protagonist who follows their vision despite great resistance), but did so in a safe and, frankly, dull manner. 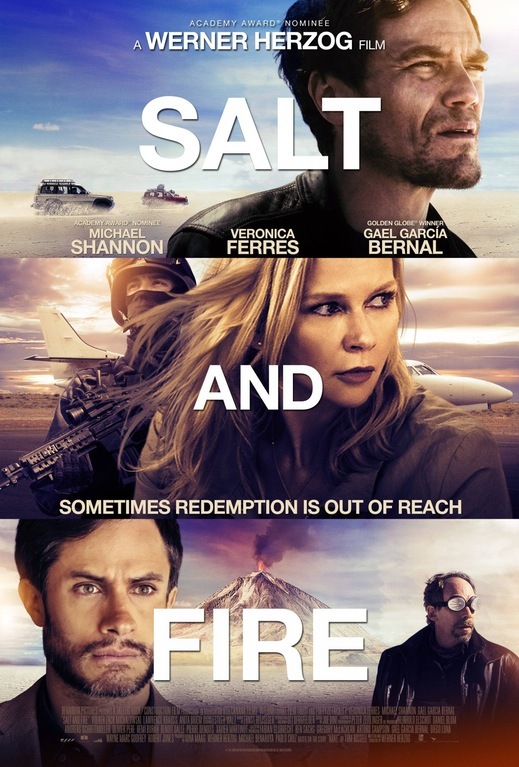 While SALT AND FIRE has some issues of its own, being safe and dull is not among them. The film begins with a UN delegation being sent to investigate an environmental disaster. The team, led by Dr. Laura Sommerfeld (Veronica Ferres), is kidnapped by what appears to be a terrorist group. As it turns out, though, the abductors are working for the CEO of the corporation responsible for the disaster, Matt Riley (Michael Shannon). While Sommerfeld's companions Dr. Cavani (Gael Garcia Bernal) and Dr. Meier (Volker Michalowski) are left in their cell to cope with, "the mother of all diarrhea", Riley and his right-hand man Krauss (Lawrence Krauss) offer considerable exposition before taking their captive out to an oasis in the middle of a huge salt flat. And there they leave her with 2 young children and survival rations. Whether the abductors will return or not, and if so, when, Sommerfeld does not know. While SALT AND FIRE starts out looking to be a modestly budgeted eco-thriller, it doesn't we soon realize that this is a profoundly odd film. Action and intrigue are dispensed with early on in favor of philosophical and metaphysical monologues delivered in stiff and clunky fashion. At times, even though the film is in English, it feels as if something has been lost in translation. There are also odd little touches like how Krauss, who is in a wheelchair when we first meet him, turns out to be quite capable of walking. As he informs Sommerfeld when she asks him about it, "I only use the wheelchair when I'm tire of life." One of the two boys Sommerfeld is left with carries around a Godzilla toy, perhaps as a symbol for man-made destruction as he often was in his own films, or perhaps just because Herzog found it visually appealing. Shannon gives a typically magnetic performance, and if there is any actor working today who can fill the shoes of Herzog's late great collaborator Klaus Kinski when it comes to intensity and borderline insanity, it's surely him. Ferres makes for a striking screen presence as wel, and Krauss is fun in his eccentric character role. None of these performers are given characters that feel like real people or dialogue that feels like anything real people might actually speak, but that's not to say it isn't fun watching them. Herzog is clearly following a vision here, and any fan of his will admire and respect that. The man is a true artist, but as can happen with even the best artists, the vision he pursues here fails to connect. There seems to be some kind of environmental message, but despite all the pontificating by the various characters, the message never comes through clearly. But if the film is a failure, at least it's an interesting one. 2 ½ out of 4 stars.